The CBC recently completed the documentary on Omar by adding the long awaited exclusive interview with him, recorded shortly after his release on May 7. The CBC Doc ‘Omar Khadr: Out of the Shadows’ is directed by Patrick Reed (White Pine Pictures) and co-directed by Michelle Shephard (Toronto Star). Thanks! Looking forward to watching this. 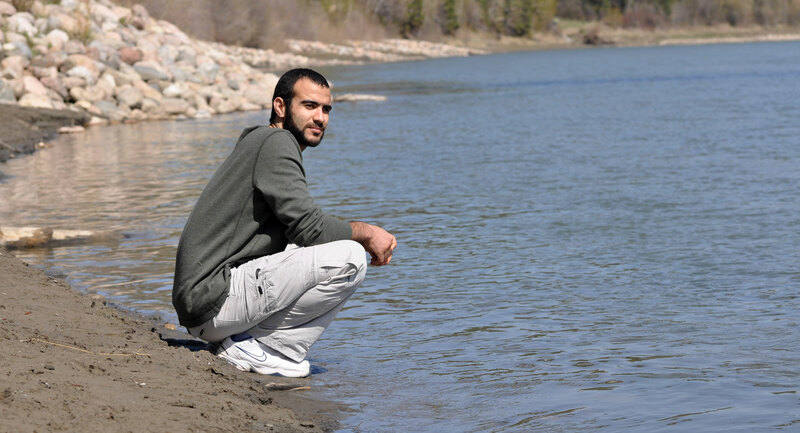 I checked the CBC television schedule for Thursday , May 28th at 8:00pm Eastern time and saw no mention of any Omar Khadr interview , I hope it won’t be ” pre-empted ” ( they can’t keep him out forever ) . Oops , I meant 9:00 pm Eastern , my bad . I have been looking forward to this, blocking it in on my schedule. It’s 9pm Pacific, too, in Vancouver Shaw Cable 209. Thank you so much Dennis and Patricia Edney. I could not stop my tears from falling down throughout the documentary. Words can not describe your gracious hospitality. I pray the path is made easy for you at all times. You are an AMAZING couple. Also please tell Omar to hang in there, he will survive this as well. Hang in there Omar, indeed you will prove the misinformed haters wrong! You did not go through all that difficulty for nothing. You have taught us all so much. Please take it easy on yourself. I’m currently traveling outside of Canada. Is there any way one can see this doc about Omar Khadr online? Omar khdar deserves all the help he is entitled to.He was victimized for nothing.